Minerals extracted from within the European Union account for just three per cent of global ore production, yet its member states consume up to 30 per cent of the world’s metal. Despite efforts to develop recycling technologies, the EU imports 200 million tons of minerals annually, and this dependency is growing every year. Europe has been mined for centuries, with many of the easy-to-reach mineral deposits now depleted. To increase European mineral production, and lessen its reliance on imports, technology is needed to access inland underwater deposits that are currently unreachable, or too small to be economically viable using existing techniques. To this end, a European team, funded by the EU’s Horizon 2020 programme, is developing an autonomous underwater mining system to reach and extract mineral deposits within inland lakes such as flooded mines, at depths of 500-1000 metres below the surface. The ¡VAMOS! 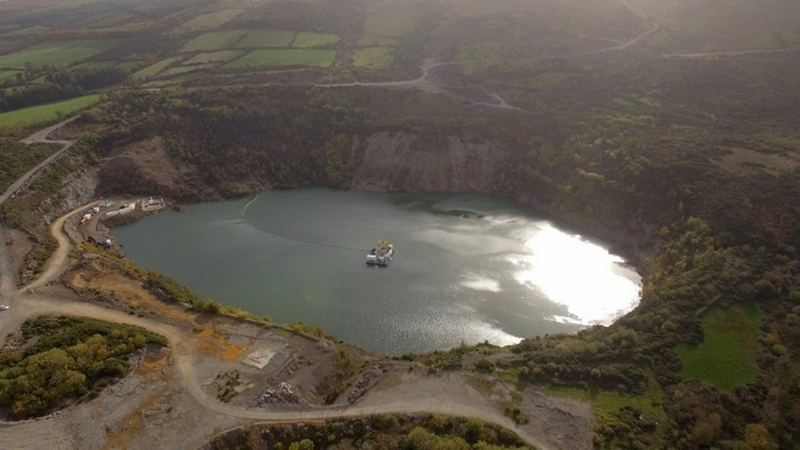 (Viable Alternative Mine Operating System) project, which is being led by BMT Group and includes 16 other partners, has recently tested this system at the Magcobar flooded mine pit, in Silvermines, Ireland, according to Jenny Rainbird, ¡VAMOS! project lead and managing consultant for EU projects at BMT. “Most mining in Europe is open-cast or deep mining, which means a lot of cut and blast on the surface, and then when those mines are exhausted they are abandoned and fill up with water,” said Rainbird. Re-excavating those flooded mines is very costly, as it involves pumping out the entire lake before the area can be mined conventionally again. “Whilst the mineral may be valuable, it’s difficult and not particularly environmentally-friendly to pump out all of that water for what could be quite a small seam of the mineral,” she said. 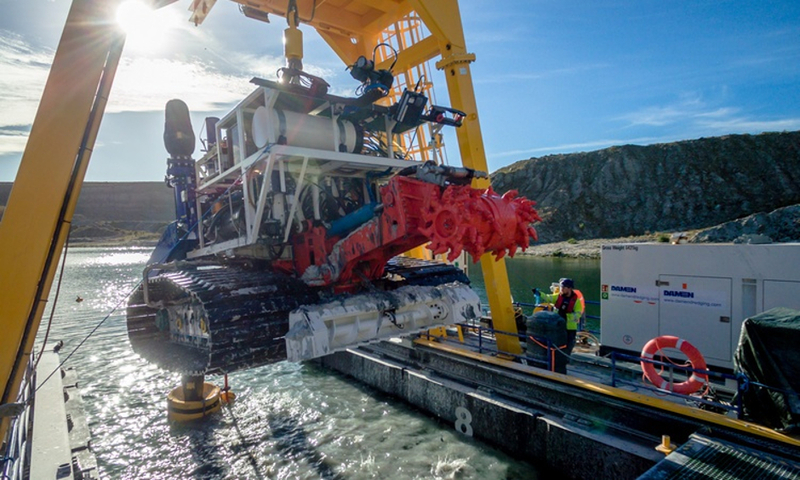 Instead, the remotely-operated mining vehicle is launched from a waterborne carriage, known as a launch and recovery vessel, and then winched down to the underwater mining site. A grinding mechanism at the front of the vehicle is used to grind the material at the surface of the rock face. The machine then collects this material, sucking it up and pumping it to the launch and recovery vessel through a pipe. Finally, the material is sent through floating hoses as slurry to a dewatering plant on the shore to be processed, said Rainbird. “The process is unmanned, so it is much safer, and because there is no dust, explosives, noise or vibration, and you are not demolishing large areas of rock to get to a small amount of mineral, it has a much smaller environmental footprint than conventional mining,” she said. The mining machine is remotely operated from a control cabin on the shore. Sensors on-board the mining vehicle collect data on its surroundings. A separate roving AUV, called EVA, also circles the mining vehicle, collecting positioning and navigational awareness information through various sensors, including multibeam imaging sonar. “The sensors collect data about the underwater area, which is fused together to create a virtual reality view in the control cabin, and the pilot then pilots the mining vehicle using a joystick mechanism,” said Rainbird. The team has also developed a laser spectroscopy system, which is capable of grading the material in real-time at the site, meaning samples do not have to be sent away to a laboratory for analysis. Estimates indicate that the value of unexploited European mineral resources at a depth of 500-1,000m is approximately €100bn. The project should allow the EU access to these high value reserves, without causing significant harm to the environment.